Friends. I have no been eating enough salad lately. I came back from visiting a few months ago on a veggie eating mission. I was so excited about vegetables! And lettuce! I was eating so much lettuce. I am embarrassed to tell you how much cake I’ve eaten in the last week. How many gross sugary candies that have been put near me that I have scarfed down. How much bread I’ve consumed. It hasn’t been good. I’m not going to give you numbers. 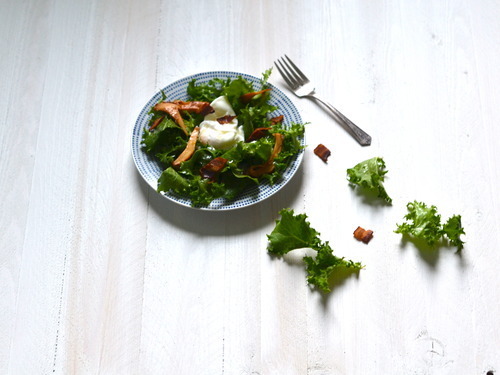 So it’s probably time to get jazzed about salad again. It’s already started a little bit, I walked by my favourite green grocer and they had the most beautiful swiss chard out, and something stirred in me. The part of me that loves healthy foods. The part of me that has been pushed down in favour of sour cherries and fuzzy peaches. I never eat candy. What is up with me lately? This salad is a slight twist on a French bistro classic. Slightly bitter frissee lettuce, tossed with a dijon vinegrette, sprinkled with flecks of bacon, and topped with a poached egg. It is the best salad. And you can eat it for any meal of the day. It’s a brilliant thing. There are two twists on this staple. The first was just that I couldn’t find frissee. So I used curly endive. It’s fabulous, but use frissee if you can. Butter lettuce would also be appropriate here. The second twist is the addition of some beautiful chanterelle mushrooms. I just added these on because I couldn’t resist buying them. I love chanterelles, and there season is so fleeting. You have to put them on everything while you can. Of course, you could omit them, or use another kind of mushroom, I wouldn’t judge you for that. But if you can find chanterelles. Do it. Curly Endive and Bacon Salad with a Poached Egg, and Chanterelles. 3 cups Curly Endive, washed and torn into small pieces. 100 grams Thickly Cut Smoked Bacon, cut into small rectangular pieces. In a frying pan over medium-low heat slowly render out of the bacon, so it get’s nice and crisp but doesn’t dry out. Scoop bacon pieces out of the fat and put them on a towel lined plate to cool. Clean the chanterelles- with a pastry brush, carefully brush out all the dirt. With a paring knife cut the very bottom of the mushroom off, just a tiny bit, and then cut the mushrooms into wuaters or sixths, depending on the size. In a small frying pan warm up the extra 2 tbsp of olive oil. Add in the mushrooms and cook until the mushrooms are nicely browned. Season generously with salt and pepper and set to the side. In a small bowl mix together the remaining olive oil, lemon juice and dijon. Poach your eggs- gently crack your eggs into the pot of gently boiling water. Let them cook for about 3 minutes, or until, when gently lifted from the water with a slotted spoon, the whites feel hard but the yolk still feels soft. Mix the endive with the dressing. Divide it into two bowls. 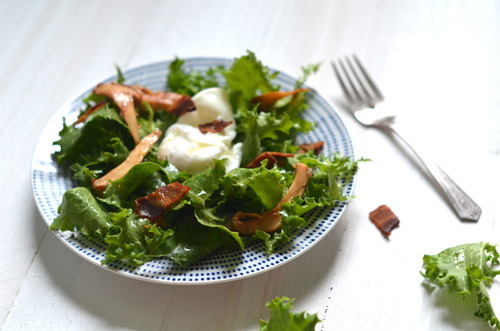 Sprinkle the bacon and chanterelles onto the lettuce, and then place a poached egg onto each bowl. And done. Get it in you.